The creation of motion picture animation requires the subtle blending of creativity and technology. When the results of these efforts are viewed, a good animated film often seems over before you know it, and you are left laughing and wanting more. The few minutes of comedy, fantasy or education that you enjoyed on the screen were probably distilled from weeks of planning, drawing, testing, photographing and editing. Professional studios require specialized equipment ranging from coded sets of paints and registration-punched acetate cels to huge, motorized (and sometimes computer-controlled) animation camera stands. A few of us however, prefer to work our way around this complexity by developing a variety of techniques for "one-man-plus-camera" situations. 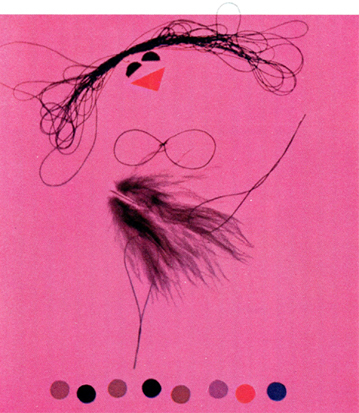 These involve such simple ideas as scratching and painting directly on clear or black leader, painting stroke-by-stroke between exposures, animating paper or photographic cutouts, yarn, string, stones, sand, cloth, foil, flowers, scissors, kitchen utensils, tools, and any other object, ad infinitum. Three frames have been repeated in sequence "A". 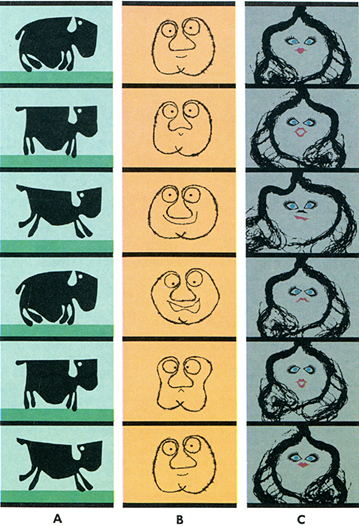 By glancing rapidly from top to bottom, the reader can detect the motion of a running buffalo. Sequences "B" and "C" are good examples of the unlimited possibilities animation has to offer. Note the changes of expression from one frame to the next which will make the character become alive on the screen. Scene A is from the film "The House that Jack Built", narrated by Glynis Johns, televised on NBC's "Exploring" Show. I first became interested in animation during my second year at Antioch College. I had worked for a commercial studio for a while and felt that a simple but imaginative approach could short-cut much of the expense and drudgery of professional animation. For my first two television spots, the artwork was inked and painted in my dormitory room and the music recorded in a garage. I soon found myself in partnership with four other students and within the next two years we produced 30 television spots and a 10-minute color film on mathematics. Our basic equipment was a Bolex H-16 camera and an old x-ray stand we found on the campus. Regardless of the approach a beginner chooses, there are a few "basics" he must be aware of. There are two kinds of animation movements: the animation of a cartoon character or object across a background, and the movement of a complete painting or background by means of a zoom, pan or spin. Illustrated above and entitled "A Burlesque of a Burlesque Star", is a charming lady inspired by trying to find a use for a loose pillow feather. Character movement can be achieved with graduated drawings or by physically moving the various parts of an object between exposures. A Bolex with single-frame release is perfect for this. Of course, reflex viewing helps solve the critical parallex problems. My present combination of a Bolex reflex camera with a zoom lens solves a great many traditional problems for low-budget animation. Reflex viewing guarantees accuracy of composition and focusing; the footage and frame counters allow the closest kind of synchronization with a pre-recorded sound track and the variable shutter makes possible a variety of fades and dissolves. The zoom lens takes the place of heavy steel columns, threaded poles and other precarious methods for raising and lowering the camera. The most common question the beginning animator asks is "How much do you move it (the subject or background) with each frame?" This is also the most difficult question to answer. It can only be countered with more questions "What kind of animated movement do you want to achieve: a lazy glide, a bursting explosion, a bouncy walk, a pregnant pause?" Traditional cartoon animation has a few formulas, of course, such as 16-frame walk cycles, but most of the timing of movements is determined by trial and error and its natural outcome -- a backlog of experience. Left is a frame from the film "The Owl and the Pussycat" which was narrated by Cyril Ritchard and shown on NBC TV. The bug on the right is the star performer in an insecticide commercial. As a rough outline for beginners, a few suggestions may be helpful. Slow down. Your tendency will be to make most movements too fast. Don't be afraid to shoot 20, 40 or 80 frames without movement. Pauses before and after action are necessary as breathing spaces. You can double-frame most character movement and slow pans (not zooms or spins) but three frames of any pose begins to show up as a distinct step. Some changes of facial expression or pose can be made without any in-between stages, i.e., a sudden change from smile to frown, but anywhere from one to five intermediate steps will probably be needed to achieve the speed and smoothness you want. Remember that rate of movement is proportionate to field size. Graduations of 1/8 inch across a six inch field are equal to 1/4 inch graduations across a 12 inch field. The exactness of movement intervals is much more critical with 1/16 inch steps than 1/2 inch steps, so the faster the action the easier to animate, especially when manipulating cut-outs, for example. As for starting your first project, a storyboard may be helpful if you are planning drawings, but too much planning can be very frustrating too. To get your feet wet and have some fun at the same time, I recommend cutting up some old magazines, colored paper, photographs and sewing basket remnants and making up a film as you go along. An 8mm or 16mm Bolex on a steady tripod, focused downward on a drawing board (or floor) and operated with a cable release in the single frame position provides a good start. After you see your first efforts (and don't be discouraged at this point), you can start the endless process of technical improvement. Just remember that what makes any animation funny or beautiful or enlightening is the mind behind the camera. Besides gathering the basic equipment, it might help to track down some of the better experimental animation films available from 16mm distributors at nominal rentals. It is good to have a little inspiration before you get into the perspiration stage. A scene by Judy Wood Spock with whom the author worked on a mathematics film "Any, Many, and Man". The scene is done entirely in paper cut-outs. 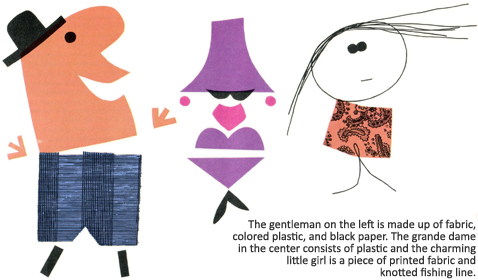 1The article above, entitled "Animation Unlimited", was published in 1963 and written by John Korty. It is reprinted as it originally appeared in Bolex Reporter (Vol 13, No. 2; 1963-1964). I'd like to thank Mr. Korty for granting me permission to republish it here. For more information, visit his website: John Korty Inc. A list of his films can be found there, or on his IMDb profile.